We’ve reached a new era in software instruments. For years, designers had produced instruments that either relied primarily on sampled sound, reproducing existing acoustic instruments, or worked mainly with synthesized sound and short wavetables, like a typical synth. 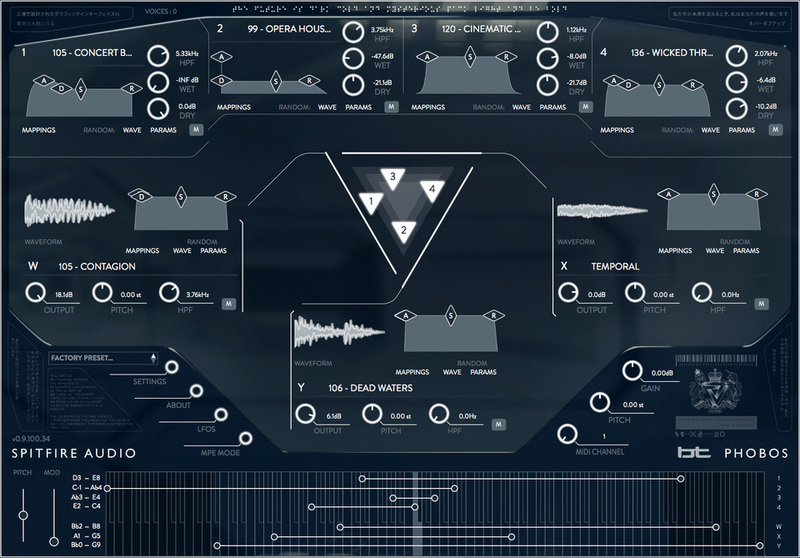 What’s happening now is we’re getting a bumper crop of hybrid instruments – ones that use extensive multi-gig sample libraries and combine them with synthesis and processing to form sounds that hadn’t existed before. I’ve written at some length about the approach of LA-based Output on these lines – and relied on their instruments when under painfully short deadlines, in particular. Now, we hear from the UK’s Spitfire, a sample house on the other side of the pond. Producer BT (Brian Transeau) is working on this particular outing – but no stutter effects here; this is all about lush, strange science fiction sounds. The developers call this a “polyconvolution” synth. So what does that mean? Well, there are three independent convolution processes in each patch – referring to a technique for digitally combining two recorded sounds. That’s a technique often associated with reverbs, because it’s well-suited to that – convolving a source with an impulse response recorded in a space is theoretically equivalent to having your source playing in that space. But you can also combine other tonal and rhythmic materials. For Phobos, that means a bunch of rhythms get convolved with a bunch of tonal materials for otherworldly results. To those three convolution voices, you additionally get lots of morphing and so on – the idea being that you hear organic transformations of sound rather than repetitive loops. There are nearly 2500 samples there, for a total of around 23 GB of data, so while you get loads of presets to get you going, there’s no shortage of possibilities for customization. In the meanwhile, there’s both an evocative trailer and a more detailed walkthrough showing you how this works. I’m very keen to try getting beyond the stuff contained in the presets to see how flexible this is as a custom sound design tool. So watch for that in the review. But clearly, as people look to outboard gear with knobs and such for more conventional synth sounds, now is the computer’s time to shine as a futuristic sample-based workstation. Phobos is available as a standalone instrument and plug-in for Mac, Windows, and Pro Tools, at an intro price of €239 including VAT.